Elan Valley Packrafting from Nigel Gray on Vimeo. Outside of the Lake District the Elan Valley area of mid Wales has probably the most concentrated expanse of water in England & Wales. So it seemed logical to bring my packraft for a weekend backpacking in mid September. 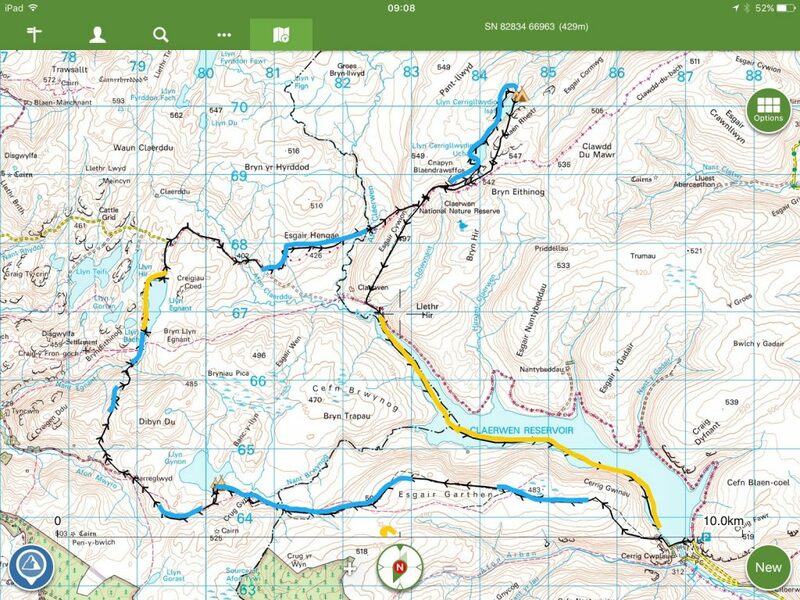 My two day packrafting route is shown below – blue shows the boggy bits and yellow the packraft legs – so I spent the majority of the weekend in or on water! With the extra weight of packraft, paddle and buoyancy aid my pack weighed around 12kg. It was my first trip with my new Anfibio Ultimate paddle from www.packrafting-store.de. The 5-piece adjustable carbon paddle was a joy to use compared to my old plastic/alloy basic paddle. As well as being adjustable, the extra stiffness was immediately noticeable, as was the ‘catch’ – how the paddle enters the water. The paddle also doubled up as a super-stiff and adjustable centre pole for my SL3 mid shelter. The dual-use theme continuing by using the packraft as a groundsheet in the tent and my inflatable Anfibio Buoy Boy buoyancy-aid helping with pillow duties. The map below shows my two-day route – blue for indicates the boggy bits, yellow the packrafting legs. The tent icons shows my two camping spots – one near Llyn Gynon and the second by Llyn Cerrigllwydion Isaf. Excellent stuff! I need to buy a packraft! Looks like a cracking little jaunt.